Hi! My name is Jaime David and I am one of ten Educators for BERNINA of America. I’m going to be hanging around the WeAllSew blog a bit more and I thought I should introduce myself. I took the position of Overlocker/Serger Specialist with BERNINA two years ago. Being on the Education Team is pretty much my dream job. In addition to working on the world’s best sewing machines, I get to work with amazing teammates. We each bring unique skills and perspective to the team and I am always inspired by what my teammates are making. Prior to this, I worked in the local BERNINA dealership for seven years. During that time I was able to pursue my Master of Fine Art degree in Textiles. And before all this, I worked as a kitchen designer, utilizing my Bachelor degree in Interior Architecture. 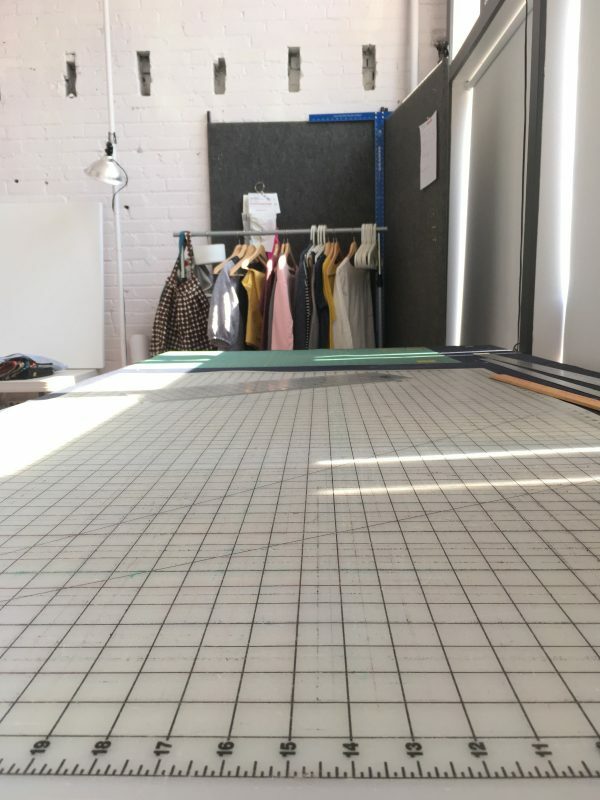 Since we are having a “share your sewing space contest” this month, it seemed an appropriate time to share mine with you. Sewing and spaces are my two most favorite things to talk about. Most of our Educators are “field staff”, so we don’t all work from the corporate headquarters in Aurora. Maybe we live near you? I live in Kansas City and consider it to be the best place to live—but let’s keep that a secret okay, it’s just a flyover state right? 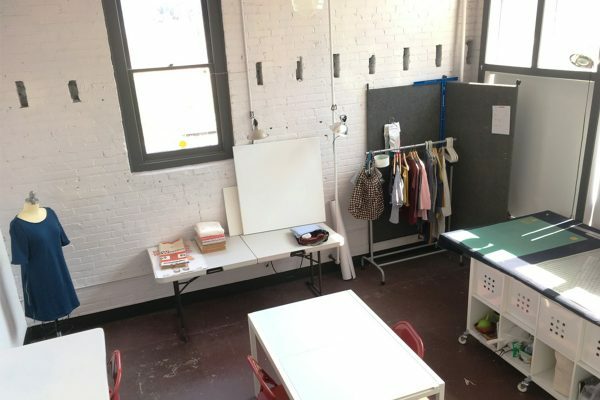 During my final year of graduate school, I decided to rent a studio space to do my sewing and artwork. My house is very small, just two bedrooms and no basement or attic. I grew accustomed to working outside of my house while in graduate school. 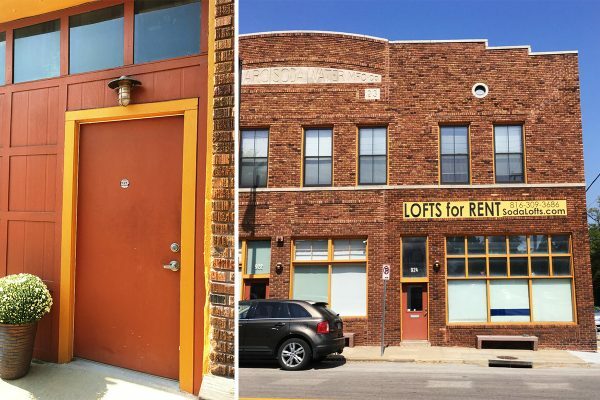 So although it seemed like a luxury, it also seemed like a necessity to find a space. It turned out to be one of the best decisions, especially as when I took this new position my studio has given me separation of church and state (work and home). As an educator I travel a lot, but when I am not on the road, I am fortunate to get to do my job here. 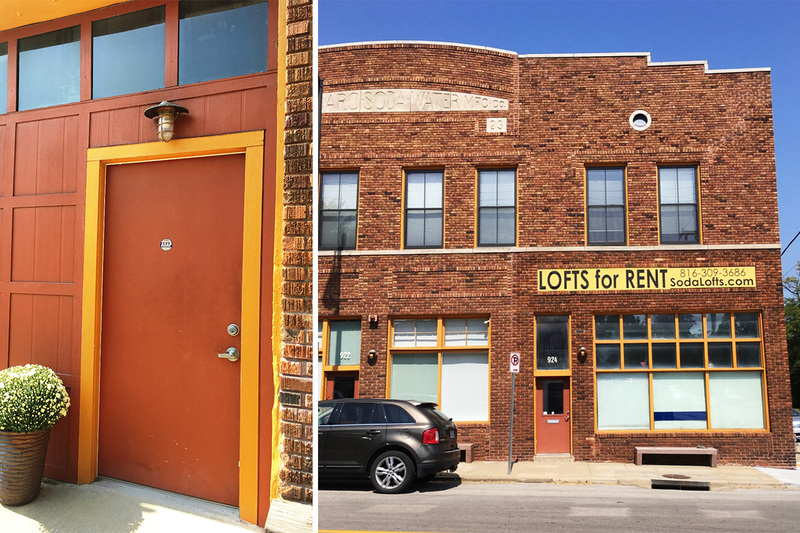 This building is located in a fun KC neighborhood near downtown called Columbus Park. Back in the day, it was a soda bottling factory. It has a lot of old charm and wonderful natural light. 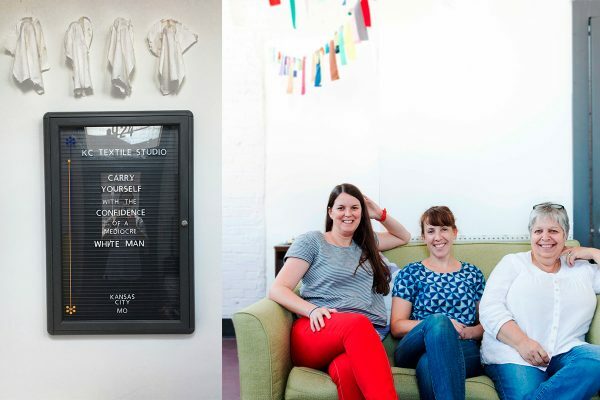 I share the front of this space (located under the sign) with two of my best friends and textile gals, Jacquie Gering and Kim Eichler-Messmer. If you don’t know who they are, look them up, because they are awesome. The corner with the dress form is magic for photography. If you’ve seen any of my work or tuturials for BERNINA, chances are the photo was shot right there. I am so thankful for the natural light even if it does make this room somewhat warm. I am also pretty much devoted to this large cutting/working surface. It is a 4’x8’ plywood upholstered with a bit of foam and canvas, then covered with a drop cloth. We can iron right on top of it or add the cutting mat and cut out patterns or square up quilts. There is NO way that it would ever fit in my house and I am so spoiled to have it. We also share many lunches and talks out here. Having the space is great, but sharing it with friends is really where it’s at. We’ve transformed this front space for art shows, a babyshower and various workshops. Each of us has our own room with a door, and that hallway is where we all store our “stash.” It’s not exactly a pretty hallway, but it does the job. Having a door means that I can close myself in and really focus or totally trash the space and then go home. These photos show the “tidy” version of the space, but I can honestly say it is always in a state of flux and rarely looks this neat. 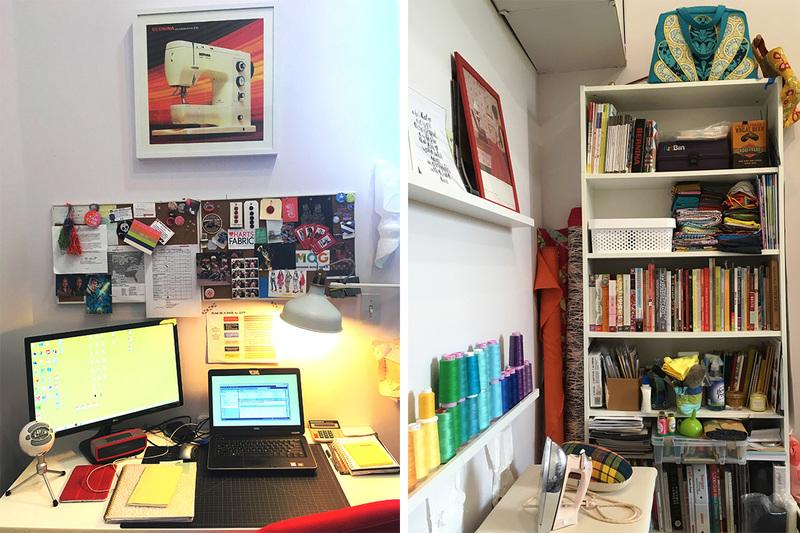 My little space serves lots of functions; office, library, ironing, art room, sewing space. I have so many special things stashed away in here. The quilt behind the sewing machine was made by me. It is made from paper. The white paper in the quilt was also made by me on a summer study abroad to Japan. When I say that I made it, I mean that I literally stripped the bark from the kozo branches, cooked it and beat it into a pulp with sticks, then formed it into sheets. I took those sheets and cut them up into small pieces only to sew them back together again. Yes, quilting is like that. I am still not sure if my Japanese teachers understood me when I told them I was making paper so I could sew with it. The red cubbies hold some machines, bins of fabric and most of my works in progress. I keep my sewing projects together in clear zippered bags. This not only makes them easy to move from place to place (sometimes I do actually sew at home), but it also helps keep me organized with my assignments. 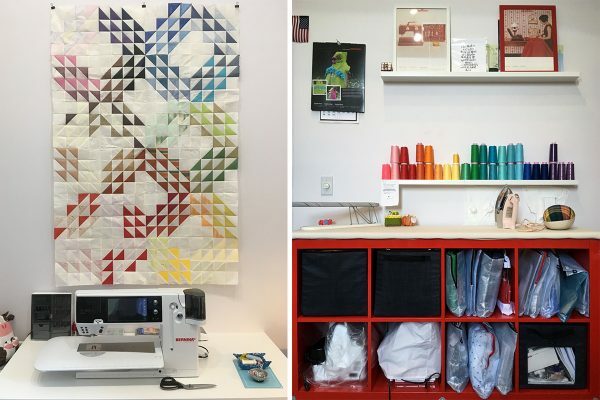 The top right cubbie is all BERNINA Capsule Club patterns for next year! I also love to put things, like thread, in color order. Who doesn’t really? I have a vintage iron and a vintage ham. Some things aren’t made they way they used to be. My desk is small. I wish I could say that was because I don’t spend much time there, but alas, most work and communictation is done through that little laptop, so I sit there most of the time. I have my trusty ipad and bluetooth speaker that bring me the company of my other studio mates: Terry Gross, Sandi Hazelwood, Gretchen Rubin and Betsy Blodgett. Podcasts are the best company when you work alone. You can see bits of my other paper artwork in the form of paper cast sculptures of house things, throughout the space. No studio or office is complete without a library. I am lucky to have a nice collection of sewing books, magazines and sample cards here at the ready. There are multiple little treasures mixed in too, like fabric, prismacolors, and cleaning tools. I have a design wall for quilting. Unfortunately, it is more of a peg board these days, but it is there whenever I decide to make my next quilt. The table on wheels is a flexible work surface where I work on the Overlocker and Coverstitch machines. Sometimes I use it for cutting and prep, but I am usually in the front space for that work. A short bike ride or walk down the street and you are in the Historic City Market. There are so many delicious things to eat here that it is almost hard to choose. 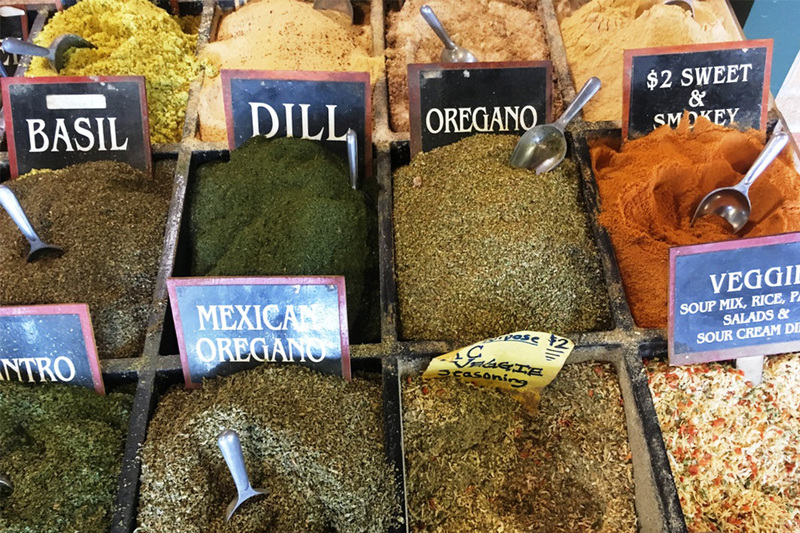 I can also pick up fresh veggies, coffee and spices to take home. 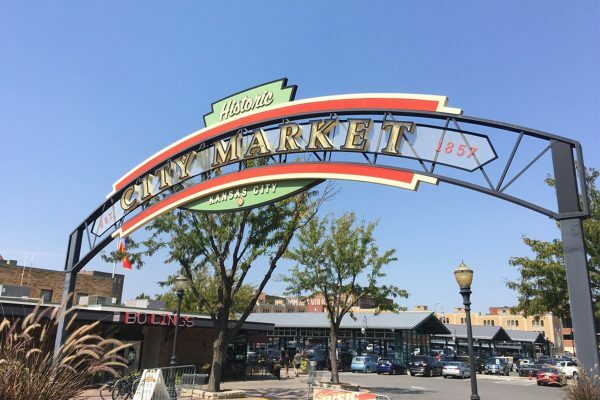 Kansas City recently opened a street car line that goes from the City Market to the Cross Roads Arts District, so I can head straight from work to First Friday’s art shows. What can I say, I don’t have much to complain about. Next time you are in Kansas City look me up and come by for real life tour or join me for lunch. I’m always eager for a lunch buddy. Studio envy! Love your space, Jaime 🙂 I need to visit YOU sometime, instead of the other way around! Yes! I should have gotten you over here last time you were in town. That was awesome! Makes me dream for a space of my own! Do it! You will love it. I agree, she is kinda the best ever. It’s pretty dreamy here…thanks for the nice comment. 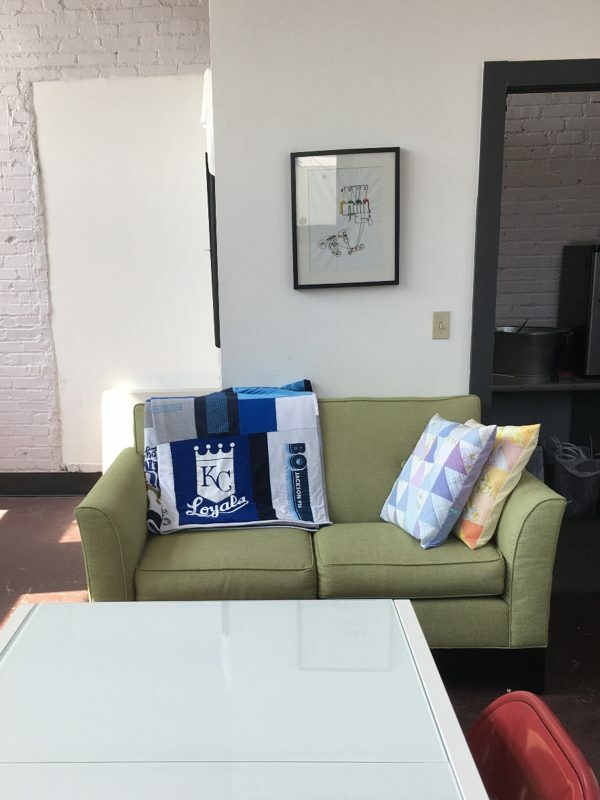 Love your sewing space and I love hat you are in KC! Does Bernina ever offer any “sloper classes”? I live in Manhattan and have been looking for anyone that offers sloper classes or a class on how to modify your dress form to be a mini-you. I think those would be great classes to help someone get that “perfect fit”. So great that you are sharing space with such wonderful and inspirational women! 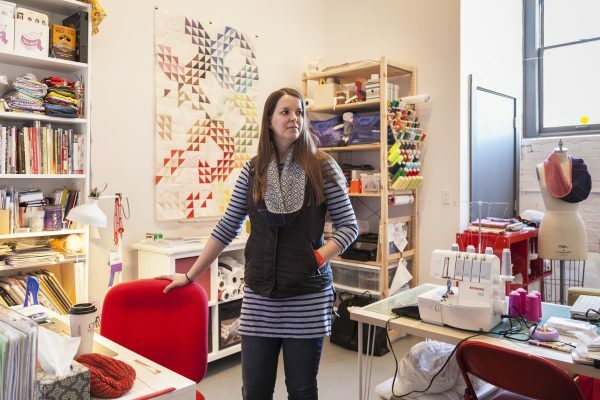 Jacque is just the best when it comes to modern quilting! I think I met you in Las Vegas last year. Did you have jeans on that your had made? I was in a serger class and you lended me a sample sweatshirt since it was freezing. How fun to see you on here. There is so much stuff to take in I peruse a little bit at a time and have never come across this. You are talented and have a lovely space for your creativity to take form. It has been a while since I’ve been to Las Vegas, but this story certainly sounds like me. I could use that sampe sweatshirt right now…it’s so cold in KC. I’m glad you enjoyed the post and the studio is indeed a lovely space. Thanks for checking in and leaving such a nice message.